Eton Soulra review | What Hi-Fi? In an ideal world, you'd probably want to investigate this clever little unit in what we jokingly refer to here in the UK as ‘summer'. Why? Because, the Eton Soulra is solar powered, just in case the mains or rechargeable battery power is just too damn last century century for your liking. 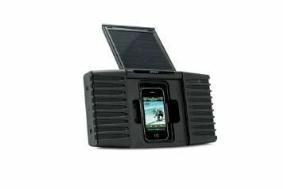 Your best bet for solar charging is the great outdoors, of course, so it's no surprise that this dock has a rugged, rubberised, splashproof aluminium body, with satisfyingly tough rubber buttons and a smart, minimalist orange and black remote control. Eton treats you to an auxiliary input and headphone out, too. That said, the rugged build might be necessity rather than choice, as it's not the sturdiest on its feet thanks to is upright stance. Select your power method of choice – an indicator light tells you which power source you're using – and you're soon up and running, with your iPod or iPhone protected behind the solar panel when it's folded down, out of use. Sadly, the sound isn't great: it's lightweight, seriously lacks clarity and could really do with the Eton being a great deal cheaper all things considered. The sound of Lone's futuristic house should be punchy and crisp but is thin and muddy here, while the syrupy soul of Teddy Pendergrass lacks detail and body. You can turn the bass control on for a bit more power but we're still underwhelmed. It's made for the outdoors, portable, versatile and built to last – and it's not often you see solar-powered kit.